By Deron Wagner|Bitcoin & Cryptocurrency Trading|Be the first to comment! About seven years ago, I began swing trading Bitcoin with a small amount of personal capital. I wanted to see if the proven Morpheus system for picking stocks in our nightly trading newsletter worked equally well for Bitcoin technical analysis. I suspected the same chart patterns we look for when trading stocks would also be the best swing trade setups in the cryptocurrency markets. Several years and hundreds of trades later, I realized that technical analysis of Bitcoin indeed works terrifically well! That’s why I am thrilled to announce today’s launch of CryptoPicks™, an awesome new weekly report for Bitcoin and cryptocurrency technical analysis and trade picks. Each weekly issue of CryptoPicks™ gives you the best cryptocurrency picks (swing trade setups), technical analysis of Bitcoin (video), and a recap of open/closed positions. This incredible new crypto newsletter is modeled after� The Wagner Daily, our flagship stock trading newsletter in continuous daily publication since 2002. 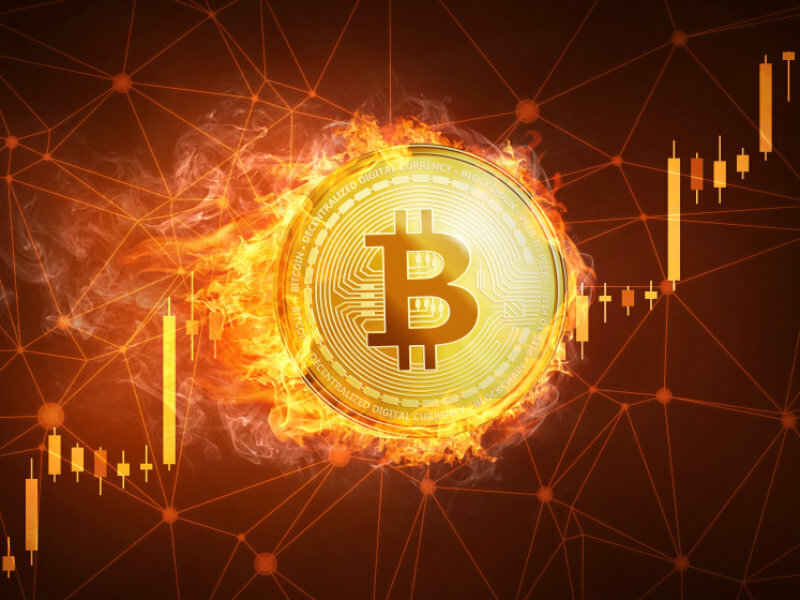 If you trade cryptocurrencies (or have ever wanted to),� scroll down and keep reading for your FREE inaugural issue of the hottest new Bitcoin & cryptocurrency trading report. By the way, there is also a brand-new long setup to buy Bitcoin ($BTC) now. If video above does not load, press here to play directly in your browser. If you cannot see the watchlist above, press here to view directly in your browser. 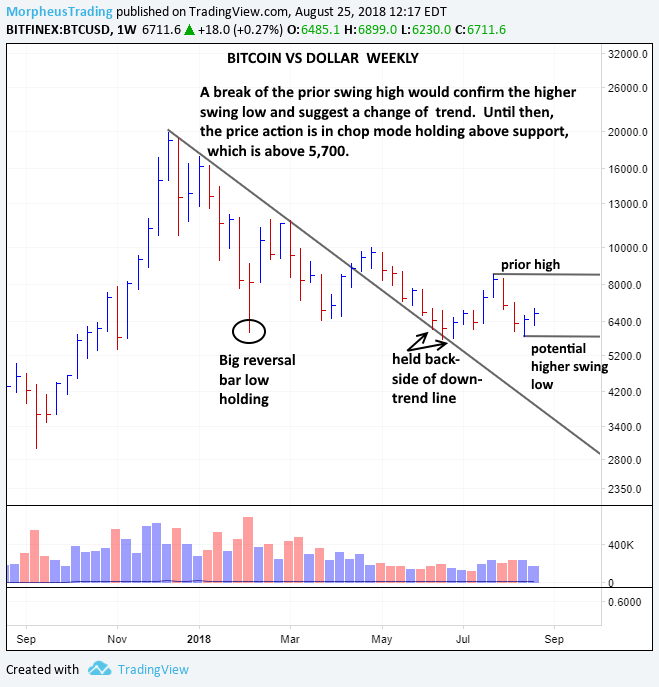 The weekly chart of BITCOIN ($BTC) vs DOLLAR ($USD) is still in “chop mode,” but there is a strong level of support in the 5,700 to 6,000 area. 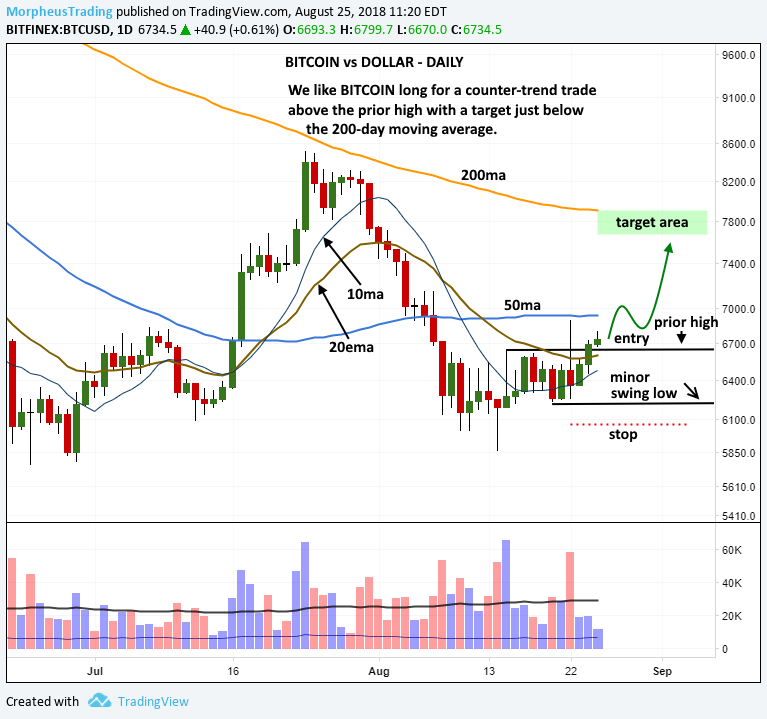 We view any continued sideways action as constructive — as long as the price holds above 5,700 and begins to set higher lows. Based on the potentially improving chart pattern in Bitcoin ($BTC), we have a new, short-term swing trade setup to buy BTC-USD. Below, the daily chart timeframe shows the price recently moving above resistance of its prior swing high at 6,650 — a short-term buy signal. The buy entry can be taken around the 6,600 – 6,800 area, with a protective stop beneath the low of August 20 (plus some “wiggle room”). The upside target area for this short-term crypto trade is just below the 200-day MA. Since this is a counter-trend trade, the plan is to sell into strength of a breakout above resistance and not overstay our welcome. The best time to sell in a swing trade is always into strength, but sometimes a defensive sell is a must. With a counter-trend trade, once we are showing a gain at least equal to the initial percentage risk, we typically raise the stop to breakeven. Remember to always honor your stop prices for proper risk management. Below is an overview of all open positions, as well as trades that were closed only since the previous week’s newsletter. No new trades were entered or exited last week. No problem! Just drop an email to [email protected] and we’ll help you out. Not yet a CryptoPicks™ subscriber? Press here to start now. DISCLAIMER: There is a risk for substantial losses trading cryptocurrencies. This material is for information purposes only and should not be construed as an offer or solicitation of an offer to buy or sell any cryptocurrencies. Morpheus Trading, LLC (hereinafter “The Company”) is not a licensed broker, broker-dealer, market maker, investment banker, investment advisor, analyst or underwriter. This discussion contains forward-looking statements that involve risks and uncertainties. A cryptocurrency’s actual trade results could differ materially from descriptions given. The cryptocurrency companies discussed in this report have not approved any statements made by The Company. Please consult a broker or financial planner before purchasing or selling any cryptocurrencies discussed in CryptoPicks (hereinafter “The Newsletter”). The Company has not been compensated by any of the companies listed herein, or by their affiliates, agents, officers or employees for the preparation and distribution of any materials in The Newsletter. The Company and/or its affiliates, officers, directors and employees may or may not buy, sell or have positions in the cryptocurrencies discussed in The Newsletter and may profit in the event the shares of the companies discussed in The Newsletter rise or fall in value. Past performance never guarantees future results. ©2018 Morpheus Trading, LLC. Reproduction or re-publication of this content without permission is strictly prohibited.